Canadian Journalist Benjamin Fulford claims Heizo Takenaka says Japan was threatened with an earthquake weapon. 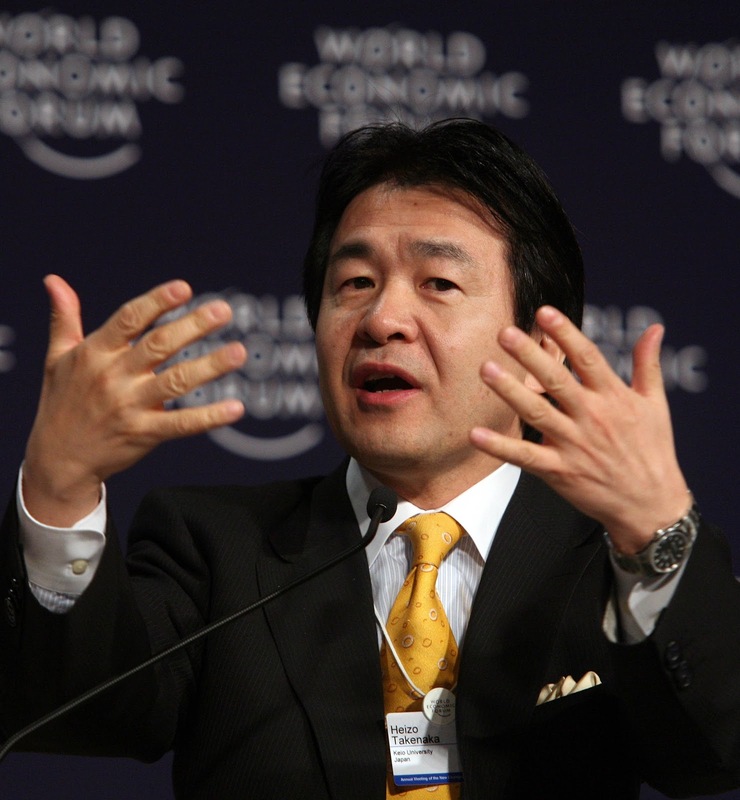 When asked why he had handed control over the Japan’s financial reserves to a handful of American and European oligarchs, the former finance minister Takenaka replied that he had been threatened with an earthquake machine if he didn’t cooperate. See the link which explains that The Bushes Are Running Out Of Money. There were two earthquakes at Japan’s largest nuclear installation in 2010, after such a threat was apparently carried out. See earlier post from December 2010, which suggests that Japan, China and Russia are attempting to resist the power of the New World Order. The tsunami is not a lone event but the most recent of a series of attacks, if this is all true. Benjamin Fulford, an American journalist living in Japan, claims to speak on behalf of Japanese secret societies that oppose the wars being generated in the Middle East and Africa by the West’s One World Government. Fulford appeals to loyal Americans to bomb the power sources of HAARP, which is located in Alaska and Greenland, and which has killed 500,000 people in deliberately generated ”natural disasters” so far. The OWG had asked the Indonesian government to open the Straits Of Molucca and join the fight against terrorism, he claims. They refused. The Indian Ocean tsunami followed. After that, they cooperated. The video explains how an earthquake can be created by using HAARP in technical terms. He appeals to the governments of Russia, China and Japan to tell the world what they know about the madmen using HAARP to threaten and kill hundreds of thousands of people. Note the Times article in the video below which shows that China was warning her nuclear plants to expect ”áccidents”. How would they know that just before an earthquake occurred near one of their nuclear installations? Here is a little background on Benjamin Fulford. He claims that China, Russia and Japan are opposing the power accumulation of the New World Order, which is interesting as a scene setter. But he is a bit garbled sometimes, spitting out too much information in short gulps. It can be very hard to take in. He likes to threaten the Wall St ”cabal” with their coming failure. This sounds a bit nuts. How would Fulford be made Finance Minister of Japan? The story about reducing the world’s population is consistent with what is known elsewhere about the OWG. I wonder who he means. Imagine David Kelly and many other people working in intelligence like David Shayler. It is possible that there are many more of them. At that time the Indonesian President was SUKARNO. Sometimes I wish Fulford would keep things simple, so we can understand what he’s saying more easily. Someone suggested he is playing both sides, but he seems to have such a fanatical hatred for Wall St financiers that that seems unlikely. He seems frightened and nervy, I would say. Just surviving is going to be enough of a job, Benjamin. The world will have to sort itself out. The Americans have got themselves into a monumental mess. Would anyone else do any better? I am prepared to believe that. Now I”m getting confused again. The martial arts bit, I mean. The plans to create a worldwide totalitarian state to consolidate their power is consistent with other reputable sources like Dr Monteith, Alex Jones and many others, who know about the United Nations’Agenda 21. I just thought it worth looking at Fulford again as he is a possible source for what’s been going on inside Japan. As usual, he is not that easy to read, but worth listening to, as he has another viewpoint on the same basic story. There aren’t many other sources to look at coming from Japan. 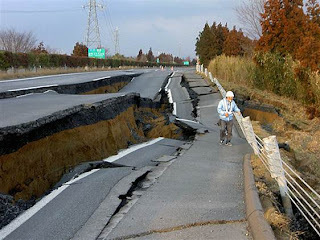 PICTURE SENT IN BY DEREK – Precision earthquake cuts along the white lines of the road…..
Is this natural forces or the artifice of man? Haarp Activity off the charts during Japanese earthquake. Thanks, Gillian. There is too much going on to take in at the moment. Obviously the source for that could be a good one, but how do we know? UPDATE 20th March – There’s a lot more about this here, including news of the progress of the nuclear cloud which has already arrived over the USA’s west coast. Extract – Anybody who has done any research into this so called ‘conspiracy’ has been shocked and alarmed by what they have found. My own research leads me to personally believe that a group of arrogant men are playing God and have little regard for human or any other life for that matter. Why would anyone want to attack Japan and hurt so many people? If there’s going to be a run on government debt, it will have to be the result of its own citizens not wanting to fund it anymore. And since many Japanese fund the government via accounts held at the Japan Post Bank — which in turn buys government debt — that institution would be the conduit for a shift to occur. By privatizing Japan Post, [Koizumi] aims to break the stranglehold that politicians and bureaucrats have long exercised over the allocation of financial resources in Japan and to inject fresh competition into the country’s financial services industry. His plan also will create a potentially mouthwatering target for domestic and international investors: Japan Post’s savings bank and insurance arms boast combined assets of more than ¥380 trillion ($3.2 trillion) . . .
A $3 trillion asset pool is mouthwatering indeed. In a 2007 reorganization, the postal savings division was separated from the post office’s other arms, turning Japan Post into …………. Sorry about the length of the link, but this facebook album has one particular shot directly linked to above that stands out. Another almost identical was show in a group of stills from a paper (can’t find it now) in which a section of roadway had collapsed under the substrata movements. In the latter case, a yellow central line seemingly dividing the two halves of a two lane tarmacadammed road was the perfect division of strata that had split apart and ended up at very different levels. There were engineers with tape measures in attendance, and it may have been that they had painted the edges of the divide for some dsafety reason. That was certainly my frst conclusion, but under such devastating circumstances as that which has happened, why spend time on that? In the facebook image, it is again the prefect divide along white lines, both at the road edge, and in the road centre that have been followed – just like tearing along a dotted line. Dotted lines and similar perforations are man made. A very strange coincidence, or maybe not? I see from a blog post in December 2010 that Benjamin Fulford was talking of HAARP setting off earthquakes in Japan being used a threat a while back. There seem to have three attacks made on Japan of which this is the third and the monumentally most devastating. Why doesn’t Fulford show in the video Takenaka actually making the claim that Japan was threatened with an earthquake machine? I think he is a mythomaniac. Good point, Zac. He claims the interview was recorded. Mind you it would be in Japanese. He could help us by giving a bit more to go on. I could of sworn I seen this video years ago. Either way I know I saw a Youtube video a long time ago explaining one of the earthquake threats> Way before March of this year.